Seems that one of the loaches had decided it was way cool to get wedged up the back of the gas generator, and couldn’t get back out. I gingerly pulled off the device from the side of the tank, and the loach fluttered off, a little dazed. No sooner had I put the generator back did another loach zoom up and get jammed. It must’ve been told that you got a “wicked headrush, dude”. And for this reason, loaches don’t rule the earth. Biked to work today, and just got back. Maybe not the smartest choice of a day — second hottest of the year, with thunderstorms threatened — but I made it. Going there was rather slow, as I got lost a couple of times, but coming back was faster than transit. If I felt really nerdy, I’d post my route as GPX, but it’s a bit twisty. The only downside about being part of the Billboard Battalion is that you get a lot of mail from the city. I get a separate letter for each variance contested, and sometimes duplicates, so I get between four and twelve letters after each community council meeting. You would have thought they could have stuck them all in one envelope, or used e-mail, to save money and paper. But no; we’re a world class city, after all. 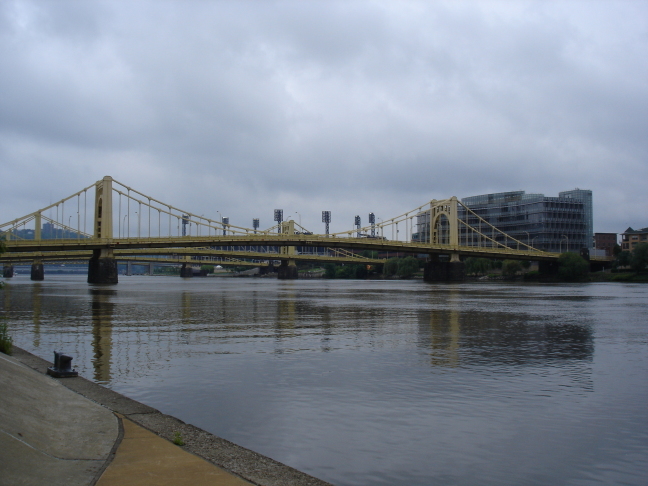 We’re not getting the best weather for the conference, but I hear that the coincidentally-running Three Rivers Arts Festival has had rain 18 out of the 20 years it has run, so noone’s surprised. Conference hasn’t quite started yet, but the preliminary swag is quite promising; yoyos and balsa aircraft. I guess I got some losses near the hub there, but at least it worked. I was the only developer type there (there was a DoE person, and lots and lots of Pennsylvania teachers). 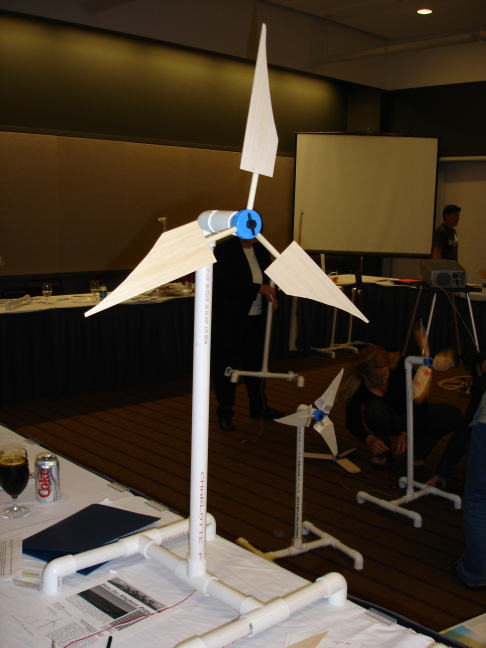 I came away impressed, and hope I can work with Michael Arquin of KidWind to bring the project to Ontario. When I was testing BlackBerry typed-alike words (dactonyms?) I found that sqlite was averaging about 1 insert per second. This is by no means good. It works out about 1000 times quicker this way. Further to my citizenship test, I have my ceremony on the 18th! It is absolutely tiny, and it looks as if it has never been opened, let alone used. 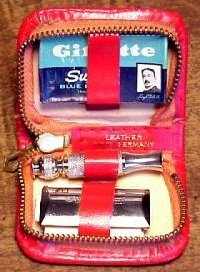 The blades are still in their cellophane wrapping, and the razor has its cardboard “blade” in place. I wonder how old it is? The case doesn’t look very robust (it’s that cardboard leatherette that falls apart at the slightest use) but I’ll be able to shave in style anywhere in the world. Just did my citizenship test. 20 questions, two of which you must get right, three of which you must get at least one right, and fifteen non-mandatory questions. Pass mark is 12/20. Seemed not very difficult, either:— who was the first prime minister, who can vote, when was the Charter introduced, when did Newfoundland & Labrador join the Confederacy, when did Nunavut become a territory; that sort of thing. To think I spent all that time worrying about natural resources, the third line of O Canada! and Lieutenant Governors (sings: Bartleman, Bartleman, Does everything a … hey, wait a minute, just what can a bartle do, anyway?). It did dismay and astonish me how badly prepared some people were. About 5 out of the 40 people didn’t turn up, and maybe 10 people didn’t have the requisite papers. C’mon people, don’t you want to be Canadian? Eep! Notice of my citizenship test arrived — it’s on the 12th — and I can’t even find, let alone have read, my copy of A Look At Canada. Author scrussPosted on 02005-11-30 Categories o canadaTags canada, citizenship, copy, eep, ice, testLeave a comment on oh no, canada! Looks like it’s down in some way; my daily condition monitoring e-mail didn’t get through to the fido.ca address, and neither did other subsequent tests. I just bought a pair of Minigear Labs AM-1s stereo mics. They were remarkably cheap, and initial tests are good.